One good thing about the 2005 York-Rock Hill SC Christmas Bird Count: Even at 28 degrees at sunup it wasn't NEARLY as cold as last year's, when gusty winds and frigid temps in the 'teens made it difficult to stay warm--much less watch birds. This year's count, our 15th annual, was held on Monday, 19 December--an unavoidable shift from our usual date of the last Saturday before Christmas (except when it's Christmas Eve). With 19 December as a work and school day in parts of the 15-mile-diameter count circle, we recruited just four intrepid birders who could participate, but their efficiency and eagerness still provided for a productive day in the field. The morning started VERY slowly because of a dense layer of ground fog that made it virtually impossible to see tree-top birds or waterfowl on various lakes and ponds. When the fog finally lifted at about 10:30 a.m. it brightened our spirits, but by then many birds had become less active than they would have been at dawn when counting began. One of the best sightings of the day was a flock of 30 Rusty Blackbirds foraging in the driveway of a house just a few doors away from Hilton Pond Center. This is only the third time this species has been seen in on count day, and more than doubled the previous high of 12 seen in 1995. Rustys are a native blackbird species whose numbers seem to be dropping rapidly nationwide. We were fortunate to add our 107th species for the count when a House Wren was heard and seen north of Rock Hill. Last year we added the long-awaited Northern Bobwhite that--along with it distant relative, the Wild Turkey--managed to elude us in 2005. Record highs were set for two other species: Blue-headed or Solitary Vireo (3, surpassing the old mark of one, set in 1999 and 2004); and Golden-crowned Kinglet (17, exceeding the old mark of 12 from 1999). Obviously the vireo is a tough bird to get in winter, while the kinglet has been seen on 10 of our 15 York-Rock Hill counts. For two species we tied old record highs: Song Sparrow (47, set in 2002), and Rufous Hummingbird (1). A rufous was first seen in 2001 in Rock Hill near the Winthrop University Farm; a different female rufous--the now-famous Perdita (above right, photographed in 2003)--has appeared at the Jim and Lenore Berry residence in Rock Hill for each of our past three Christmas Bird Counts. It's worth noting that 36 of 106 species seen since the York-Rock Hill CBC began in 1991 have been observed on all 15 counts (see table below). Conversely, 13 species have been encountered in only ONE year. Another 19 species that might reasonably be expected in the Carolina Piedmont have not been seen at all. 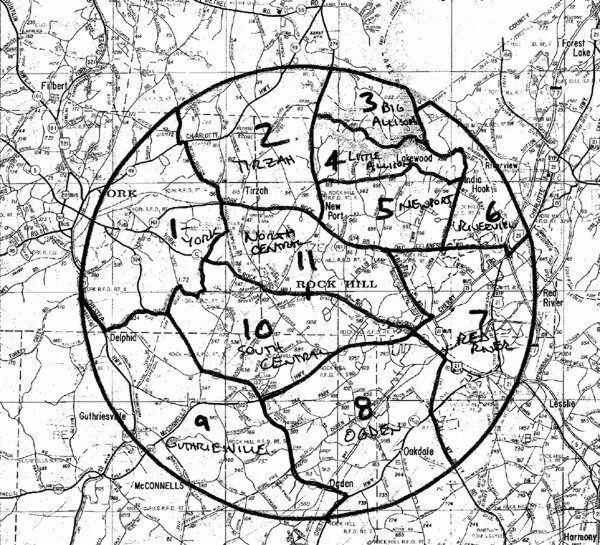 The York-Rock Hill CBC circle is divided into 11 sectors of various sizes and containing diverse habitats; most are delineated from adjoining areas by roadways. One of our favorite sectors includes the York County Landfill--a not-very-picturesque-and-quite-often-stinky-but-nontheless-productive place to look for birds. The numbers of Black Vultures and Turkey Vultures continue to decline at the site now that there's no longer open dumping of food wastes, and this year we were likewise disappointed at seeing only three Ring-billed Gulls when in past years we could count on at least several hundred and sometimes a couple of thousand. It appears gull numbers also have declined with a reduction in food scraps to pick through. There WERE two American Kestrels hanging around at the landfill, however, and an obviously healthy female (above) put on quite a show. Time and again she hovered and perched and swooped to the ground, at least twice coming up with what appeared to be small rodents--prey items that understandably would be quite numerous at that particular locale. 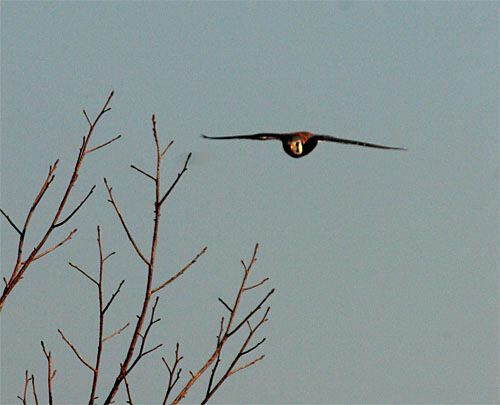 We saw some interesting birds in late afternoon when we stopped by the Winthrop University Farm in Rock Hill. Once a semi-rural spot where chickens and cows produced fresh foodstuffs for Winthrop students, the expansive landscape is now dotted with athletic fields and a coliseum. Thus far the university has withstood pressure to pave over the entire site for parking and dorms, so there are still some good natural areas remaining. One of these is a Wetlands Restoration site, created in the past few years at the west end of Winthrop Lake. We had hoped to find Swamp Sparrows and Winter Wrens in this new habitat, but there were none--perhaps because a crew with chain saws was removing overgrown shrubs from a fence line right next to the wetlands. Despite this ear-splitting noise, we were able to tick off a raft of Canada Geese and a somewhat skittish Great Blue Heron that posed in setting sunlight just long enough for us to get a couple of photos (above left). Our personal favorite bird of the day, however, was another species that is getting harder and harder to find. As we walked the boardwalk around the Winthrop wetland, we noted the powers-that-be were wise enough to leave a dead tree standing on its margin; the inviting snag contained what appeared to be a woodpecker nest cavity. Perched right above the hole was a Red-headed Woodpecker (top photo), which we knew had to be a first-year bird because its head was mainly brown with just a few crimson feathers beginning to appear. 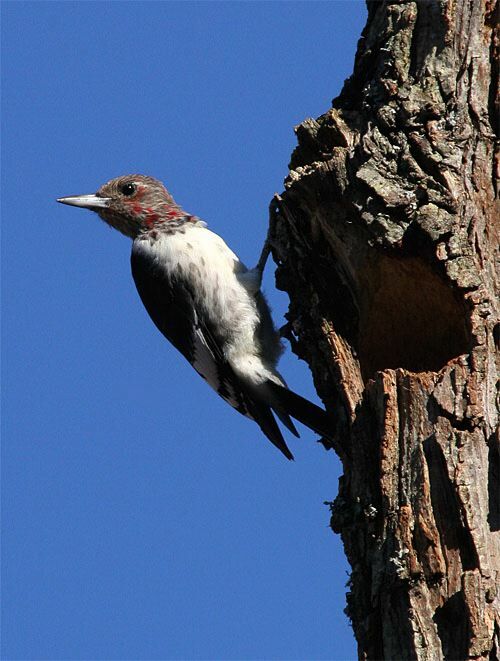 As mature forests and dead trees have become more scarce across the eastern and central U.S., so have numbers of Red-headed Woodpeckers declined precipitously; thus, we're glad to know that there's at least a small colony surviving around the Winthrop University Farm. Participating in the 2005 York-Rock Hill Christmas Bird Count were two-year veterans Chris Dewey and Steve Patterson, Susan Holland (9 years), and count founder and compiler Bill Hilton Jr. (all 15 years). Together they located 72 bird species--which tied the second-highest total for the count. We also had that many back in 1994, while the best year ever was 2000 when 80 species were found by eight folks in the field. This year's participants counted a total of 2,454 individual birds--the second-lowest total in the count's 15-year history and well below the average of 6,556. Low numbers were in part a function of having only four counters to cover the 15-mile-diameter circle; the lingering morning fog didn't help at all, nor did the relative absence of flocking birds such as gulls, blackbirds, and American Robins. There's also little doubt there is A Dearth of Birds across the Carolina Piedmont. 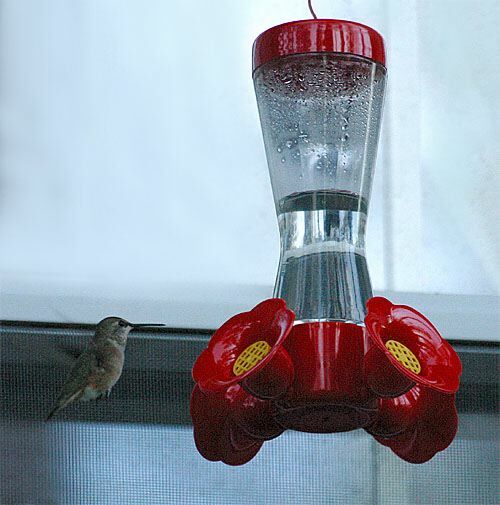 We knew this was the case from our banding results and feeder observations at Hilton Pond Center, even though some folks have suggested a good mast crop and abundance of natural foods were keeping birds away from our sunflower seeds. However, with the vast majority of species well under the 15-year average on our just-completed York-Rock Hill Christmas Bird Count, we still contend that there really AREN'T as many birds present in Upstate South Carolina during late fall and early winter 2005. 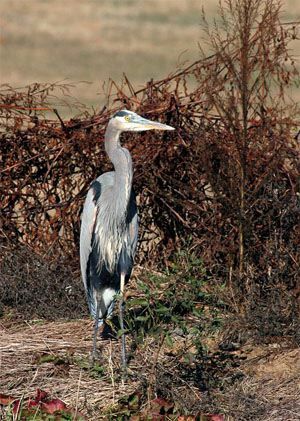 NOTE: Background information and summaries of all counts from 2000 to present are linked from the main page for the York-Rock Hill Christmas Bird Count. Next year's count is planned for 23 December 2006. Be sure to scroll down for an account of all birds banded or recaptured during the week, plus other nature notes of interest. --Freezing rain that began early on the morning of 15 Dec continued throughout the day at Hilton Pond Center, but fortunately caused only small, dead branches to fall from from our hardwoods. We did lose one 30-foot-tall Loblolly Pine that became top-heavy from ice and snapped off near the end of the driveway to the Center's old farmhouse. --The morning of 16 Dec broke clear and a quartet of Hooded Mergansers--a male and three females--was skimming across Hilton Pond. Recent rains and the ice storm were good to the pond itself, raising water levels from a late-summer four-foot deficit -to within 8" of the brim.